Congratulations to "Maureen C", the winner of Patricia's giveaway. Thank you to all who participated! Searching for a treasure ship sunk long ago, present-day marine archaeologist Cordelia Ward is pursued romantically by both salvager, Innis Foley and treasure hunter Morgan Murphy. She is haunted by a murderous nightmare where one man is the killer and the other the victim. But which man is her enemy--which one her soul mate? Can a journal that belonged to her ancestress, Lady Elizabeth York show her the answers...in time to save her true love? One of my favorite kinds of romantic suspense is the hero in doubt. I’m sure this came from the old Gothics I read, starting with Mistress of Mellyn by Victoria Holt when I was twelve. The characters in the old Gothics were an innocent heroine and two men, one the hero and the other the villain, with the reader trying to figure out who was who. Sherrill Bodine wrote the historical half of WRITTEN IN THE STARS, while I wrote the contemporary. Sherrill’s hero and villain are very clear, no guessing there. Sherrill wrote a perfect hero and heroine and a dastardly villain in their historical lifetime. In my story, her heroine, hero and villain are reincarnated in my characters. Of course I always like turning the expected on its head. I’m always looking for that edge to cross. So, harking back to the those old Gothics I loved, when they all meet again four centuries later, I couldn’t write perfect or perfectly dastardly reincarnated characters. I had to mix things up a bit. I didn’t want it to be clear as to which of the two men in my story is Cordelia’s hero. I give readers the challenge of figuring out which man is the hero and which the villain. Now Cordelia grew uncomfortable as she always did when a man sounded like he meant to get serious about her. It wasn’t that she didn’t want someone in her life, but that she wanted the kind of relationship her parents had cherished. A soul mate. The problem was recognizing him. Was he standing before her now? Cordelia agonizes throughout the story. Two men want her. Two men love her. She’s attracted to both. Dangerous things happen to her, and she keeps having a dream vision – a dive for the sunken treasure, in which one man cuts the other’s airline. Which man is a potential murderer and which man is her soul mate? I had great fun writing my part of the story. As a reader, do you want to be clear on the hero or do you enjoy a hero in doubt? 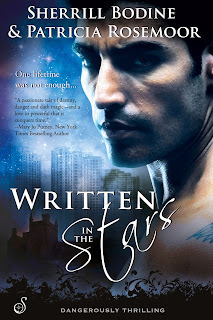 Comment for a chance to win a digital copy of WRITTEN IN THE STARS by Sherrill Bodine & Patricia Rosemoor. “Not that I see the difference, but how about I offer you this.” From his pocket, he pulled a diamond-studded gold chain from which hung a crescent moon set with sapphires. “Exactly.” He took her right hand from where he’d trapped it and placed the artifact in her palm. The touch of metal and jewels to her ring electrified Cordelia. Startled, she gasped at the power but wrapped her fingers around the jeweled moon so she wouldn’t drop it. Her heart beating too fast, she took a closer look and recognized its age. This was no modern copy of something old. Fearing he’d found this on his earlier dive, would somehow beat her to the motherlode, she panicked. “All right, partners, then, but we need to work out details—"
Before she could finish, he curled his fingers over her hand with the crescent and kissed her. The chain trapped between their hands connected them like a live wire, kept them from pulling apart. The current spread to every pore of her body, to her head, to her toes, to her feminine center. She had never felt so alive, so sure of herself. The setting of Written in the Stars sounds entriguing and so different from other stories I have read. Can't wait to read it. I do not mind a hero in doubt... makes things a bit more interesting... love the sound of this book! I always like conflicted heroes, and for the reason you gave -- good drama. I love the story so far it sounds exciting! High romance and high drama. Enjoy. I do like to read stories where the hero is in doubt like Gothics. I think it is realistic since in life it is not so easy to recognize the good guys. You know, I don't usually go for books with a "magic" influence, but I am intrigued by your description. I, too, am enamored by the "Hero in Doubt" concept and look forward to reading WRITTEN BY THE STARS.